It would have been easy for McLain Ward to jack up the fences and put together a challenging course for his clinic at Rutledge Farm. After all, all four riders in attendance compete in grand prix classes themselves and brought experienced mounts. Instead Ward dialed it back, looking at the small details that compound themselves and often lead to mistakes. 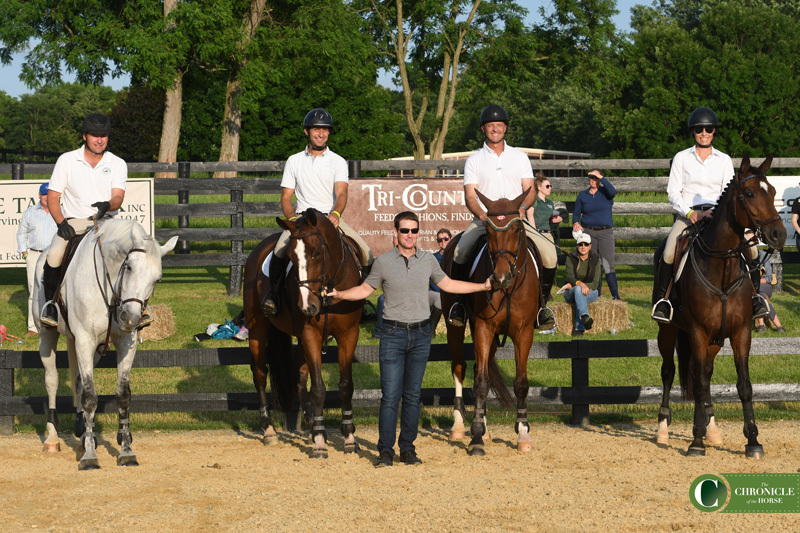 McLain Ward (standing) with clinic participants (from left) Matt Hollberg, Agustin Rosales, Gavin Moylan and Tiffany Cambria. All photos by Kimberly Loushin. Ward began the session by talking about his training philosophy while the riders warmed up. 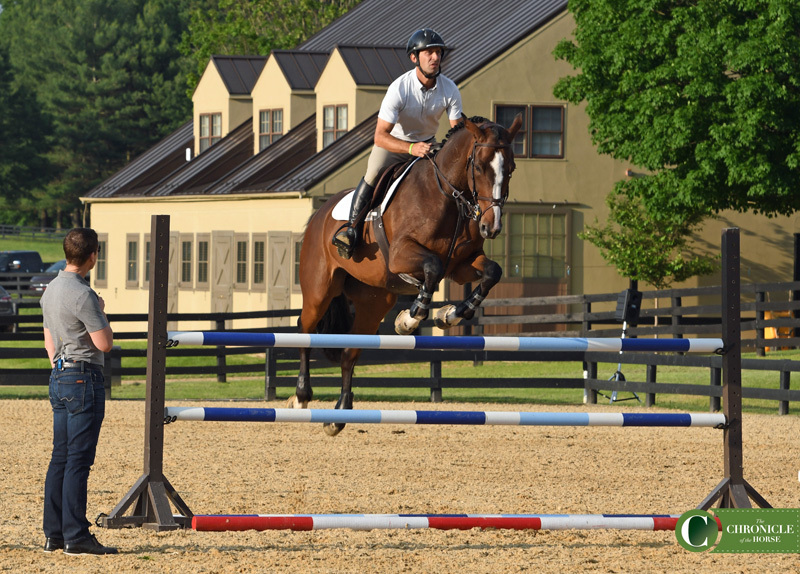 He reminded riders that warming up for a jump school is going to look different from a straight flat session. But the concepts were consistent: Get your horse loose and relaxed and then focus on getting him forward into the bridle. He encouraged riders to look at their aids on a scale from 1 to 10 and find the balance of each aid that worked for the horse in that moment. 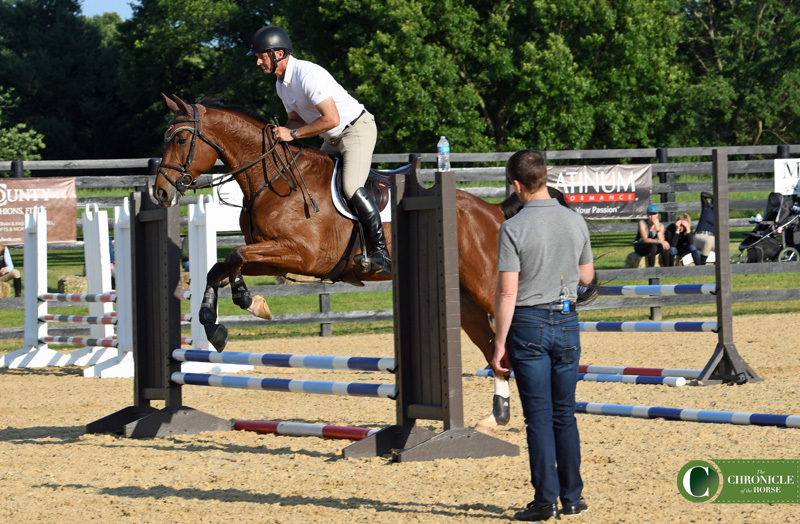 None of the exercises McLain Ward set up were overly technical, but they allowed the riders to pay attention to their ride between the fences. Ward encouraged participants to always go back to straight and forward when things got difficult. Often riders will resort to fancy lateral work or counter canter when there is a simple solution available. “If I can have forward and straight and in a good rhythm I’m going to beat you more often than not,” Ward said. None of the exercises Ward set up required rocket science. They started over a single crossrail, which later became a vertical. Next came a gymnastic Ward has set up in his ring year round, a 9′ ground rail to a low vertical, one stride to another vertical with a ground rail between. Then he added a short five-stride and an easy two-stride to make a small course. Ward is known for being a stylist, and he zeroed in on the adage of “form equals function.” He reviewed the tenets we all learned in our early lessons: hands up to create a straight line to the bit; elbows in to maintain leverage against a strong horse, keep a relaxed thigh and knee with the calf on and let the horse jump to you. 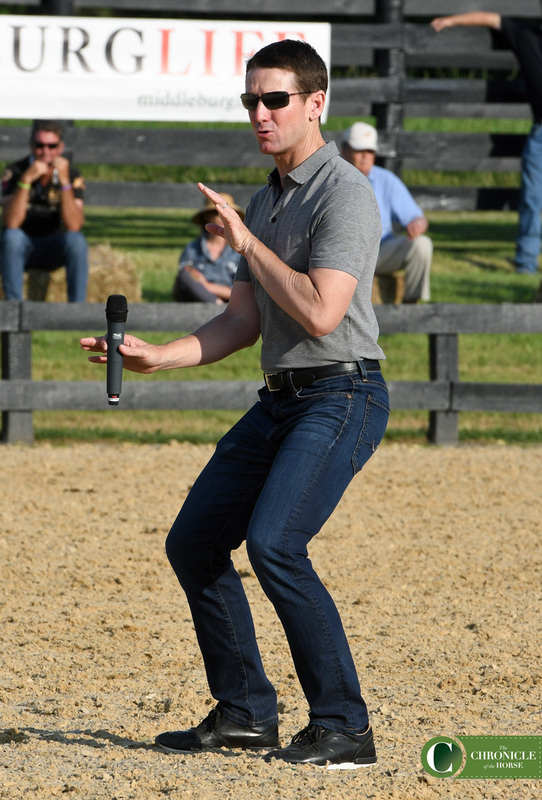 McLain Ward encouraged participants to focus on their position throughout the clinic by keeping their weight balanced and letting the horse bring its withers to them in the air. Matt Hollberg had the tendency to lower his gaze as he rode, which caused the entire balance to fall forward on the forehand. In doing so, the gray got heavy on the landing. As a result, the recovery time between fences slows down, which makes everything else on course feel like it’s coming up quicker. Ward wanted Matt Hollberg to keep his eyes up to bring his horse’s entire balance up. With courses becoming increasingly difficult, it’s tempting to micromanage, but in the end that ends up being counter-productive. 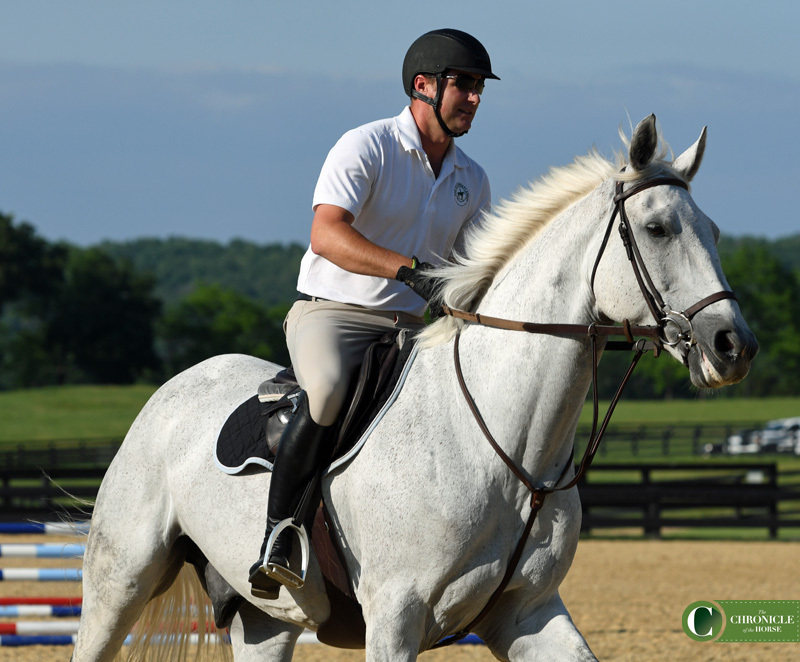 “The way the sport has gone with the time allowed and the careful jumping, you need to land and follow your horse—that doesn’t mean creating a lot of impulsion—follow your horse through the turn and then be balancing to the jump,” said Ward. “Not only because the jumps are super careful, but the distances are quite technical. You can’t go slow, slow, slow because you have to make the time allowed. You have to follow the horse through the turn and then always be balancing, and that doesn’t necessarily mean adding at the fence. It means compacting your horse. It’s about coiling the horse together at the end, obviously to give your horse the support for the careful fences, but also the short distances that were coming. Ward praised Agustin “Chicho” Rosales for his horse’s rideablity on the flat but cautioned Rosales, who has a dressage background, against getting too focused on controlling every step. Ward encouraged Agustin Rosales to trust his horse’s training rather than dictate every single step, and it smoothed out the entire course. He sent Rosales back on course, reminding him that the only thing on his mind should be the approach to the fence, not worrying constantly about his horse. As Rosales jumped around the simple course, Ward struck up a conversation, asking first if he’d had breakfast before launching into a goofy interrogation about the contents of Rosales’ meal. Initially Rosales faltered over the inquiries, but once he relaxed and allowed himself to multitask a bit his entire ride smoothed out. “Did anybody notice his corners?” Ward asked. “It was a stupid conversation, but it took his mind off of working his horse every stride on the course. It distracted you for just a moment that you weren’t flatting your horse between every fence.